Carlton Jamon grew up in Zuni Pueblo, New Mexico. He learned silversmithing from his grandmother Cornelia and his mother Winnie. He started his career in 1984 with the intent to innovate away from the Zuni lapidary tradition. His goal has been to learn and master techniques such as engraving and detailed cut out work. He calls his work “silver lace”. He founded the Zuni Cultural Arts Council. Carlton regularly shows at Santa Fe Inidan Market. In 2012 he won first prize in “Contemporary Use of Material”. "Journey" is the name Carlton Jamon has given to these whimsical and appealing earrings. Textured and twisted in a swirl they are more complex than meets the eye. Incredible cut out work characterizes this innovative heavy sterling silver bracelet. Zuni jeweler Carlton Jamon has created a technique like no other. 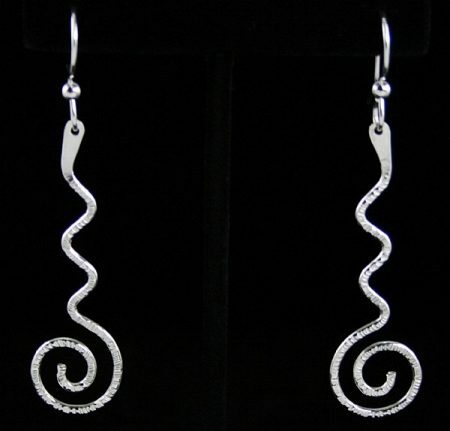 He cut the sterling laboriously by hand and delicately stamps the piece creating beautiful flow. 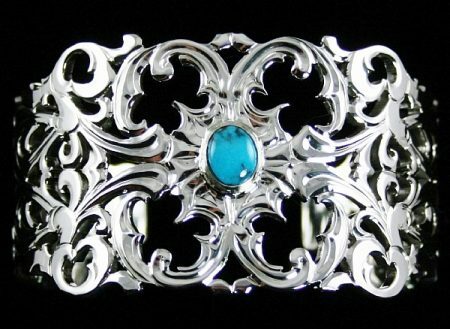 A fine rare gem grade natural Bisbee turquoise cabochon is set in the center to set off the design he calls "silver lace". The turquoise is deep classic Bisbee blue with hints of reddish-brown matrix. 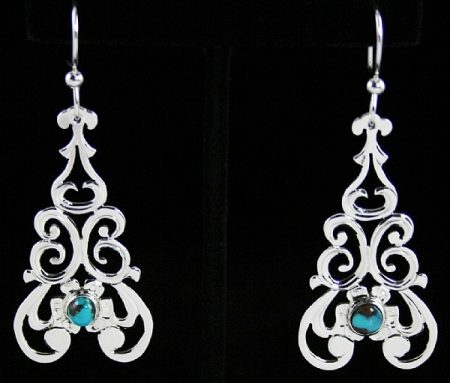 Zuni jeweler Carlton Jamon has created these beautiful earrings cut out by hand. The design is called "silver lace". He has finished them by selecting two perfectly matched rare gem grade Bisbee turquoise cabochons to nuance the appeal. The natural Bisbee is classic blue with hints of red host rock matrix.